We had some guest visitors to our summer camp at the Springfield Armory historic site yesterday. Reba Jean and her daughter, Piper, are both historians, who conduct immersive workshops with students as a way to teach them about the past. She calls this “material culture,” as in the objects from the past can bring to the surface the stories of the people who lived in a certain time. A little research on this term, which was new to me, showed me that this is a common historical concept. Material culture is the physical aspect of culture in the objects and architecture that surround people. It includes usage, consumption, creation, and trade of objects as well as the behaviors, norms, and rituals that the objects create or take part in. The term is commonly used in archaeological and anthropological studies, specifically focusing on the material evidence that can be attributed to culture in the past or present. 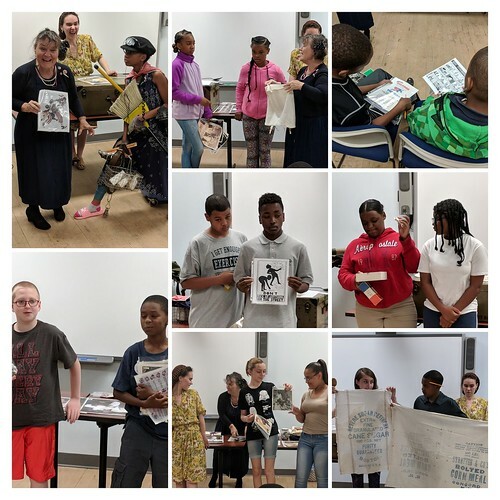 Since we are exploring World War 2 and women at the home-front (when men went to war, the women of Springfield were recruited in neighborhoods to work in the Armory, disrupting families and forever altering the social fabric of the city), Reba Jean and Piper presented our young writers with objects and stories of the time period. It was fascinating to watch our middle school campers come to learn about rations, and gender expectations, and the sacrifices of children. They held a jar of recycled aluminum foil balls that would be donated to the war effort, fingered old sugar and food cloth sacks that were used to repair socks when other materials were not available, smelled the old rubber tire used for soles of shoes, read comic books with superheroes fighting for the Allies, and more. The most powerful stories came from the objects of her own father-in-law, who had inscribed into his tin water cup the many places he fought in the trenches in WW2 but never talked about at home. She also had a recovered bayonet from Germany that her father-in-law brought home, not as a souvenir of war but as a reminder of childhood. Inside the bayonet casing, you can smell the mix of oil and materials that evoked the smell of crayons, and she said her father-in-law and other soldiers would smell that smell when they were scared or lonely or homesick. All of us in the room took a sniff, experiencing what he also smelled as the war raged around him. 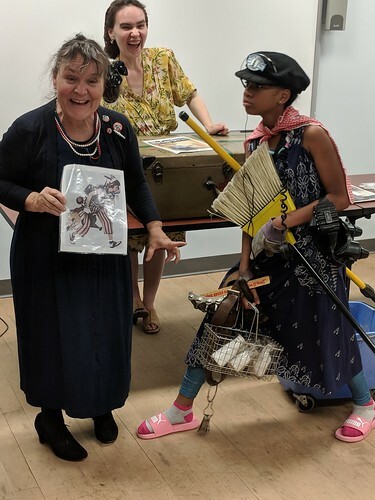 Finally, a student volunteer was “dressed” to resemble the famous Rosie the Riveter image of WW2 home-front, with the student nearly falling over with all of the “stuff” Rosie had to carry to stay strong at home. Overall, our campers learned so much, through the touching and exploring of the “material objects” which brought the stories of the past to the surface in tangible and important ways. This entry was posted in nwp, Springfield Armory, WMWP. Bookmark the permalink.